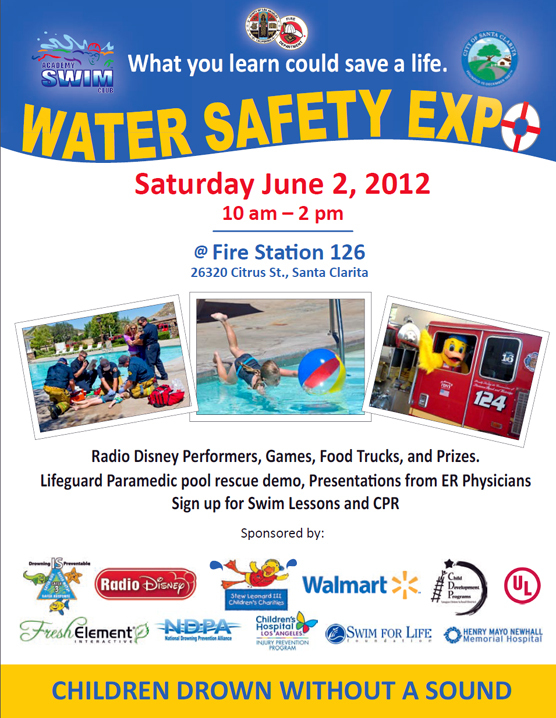 Firefighters use water to put out fires, but on Saturday, June 2, from 10 a.m. to 2 p.m., they will warn families about how water can take lives by demonstrating the critical importance of pool safety during the 2nd Annual Water Safety Expo at Los Angeles County Fire Station 126 in the City of Santa Clarita. This free family fun day will also include a drowning rescue demonstration by paramedics which begins with a real 9-1-1 call. Radio Disney performers will entertain the kids, and Stewie the Duck will help parents and children learn to swim for safety. Emergency room physicians will provide education and a family will present their personal story as they “Remember Christopher.” Saugus Union School District Child Development teachers will provide activities for kids while parents attend educational presentations. LACoFD proudly acknowledges its many community partners for participating in this life-enriching event, including the City of Santa Clarita, Academy Swim Club, Swim for Life Foundation, Stewie Children’s Charities, Radio Disney, The National Drowning Prevention Alliance, Priority One Fencing, Santa Clarita Lifeguards Private Lifeguard Services, Henry Mayo Newhall Memorial Hospital, American Heart Association, and Children’s Hospital Los Angeles. Founded in 1923, the Los Angeles County Fire Department is an international leader of the fire service and one of the largest emergency service agencies in the world. Each day, more than 900 firefighters and lifeguards are on duty to provide fire protection, life safety and environmental protection services to more than four million residents and businesses in the County’s 2,300-square-mile area. When called into action following major disasters, the Department’s Urban Search and Rescue Team responds around the nation and the globe as members of California Task Force 2 or USA-2. Once back in Los Angeles County, these same elite responders can be found at work in hometown neighborhoods in 58 cities and unincorporated areas served by the Department. The organization proudly continues to be a frontrunner in firefighting technology, offering specialized training opportunities in Urban Search and Rescue, Emergency Medical Services, Hazardous Materials, Air Operations and Homeland Security. Behind the scenes, more than 800 dedicated business professionals help carry out the mission. For more information about pool safety, contact LACoFD Community Services Liaison Stephanie English at (661) 287-3690, or the Public Information Team at (323) 881-2411. Kudos to Fire Station 126 and their partners for hosting this important public education event to prevent child drownings. I wish every fire station in the country would do the same thing.